The 3D HERO System allows you to combine two 1080p HD HERO cameras into a single housing to record 3D video and photos while simultaneously recording in 2D. A synchronization cable plugs into the rear HERO Port on both cameras to join them together, enabling both cameras to record video and photos in perfect synchronization. The 3D HERO System allows you to combine two 1080p HD HERO cameras into a single housing to record 3D video and photos while simultaneously recording in 2D. A synchronization cable plugs into the rear HERO Port on both cameras to join them together, enabling both cameras to record video and photos in perfect synchronization. This is a requirement for professional quality 3D and is available only from GoPro! The included 3D editing software, GoPro Cineform Studio, makes it easy to convert your 3D HERO System footage into viewable 3D files you can watch on your computer, online at sites like YouTube, and on your 2D or 3DTV at home. 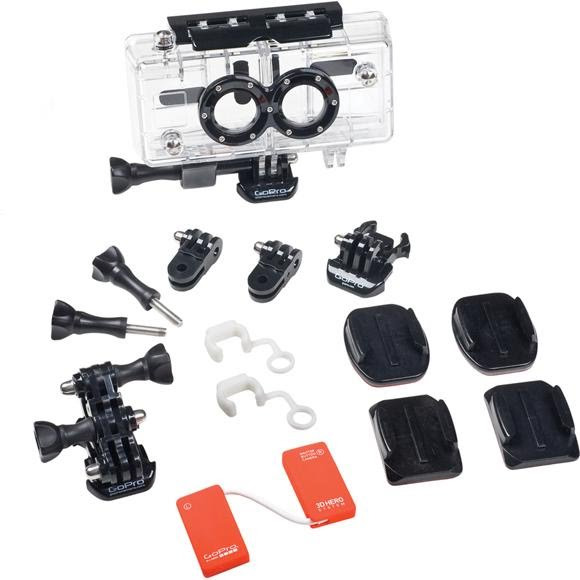 Mounting System is compatible with all GoPro accessories. 3D waterproof housing is rated 180&apos;/60m deep. Record 3D and 2D video and photo files simultaneously. Includes FREE easy-to-use 3D editing software - GoPro CineForm Studio. 3D Waterproof Door + Skeleton Door. 3D Anaglyph Glasses (3 pairs). 2 Flat + 2 Curved Adhesive Mounts. FREE GoPro CineForm Studio software.